Eagle Valley’s Erich Petersen shoots and scores against Battle Mountain on Thursday night in Gypsum. The Devils beat the Huskies for the first time since 2009. GYPSUM — March Madness apparently also applies to lacrosse. 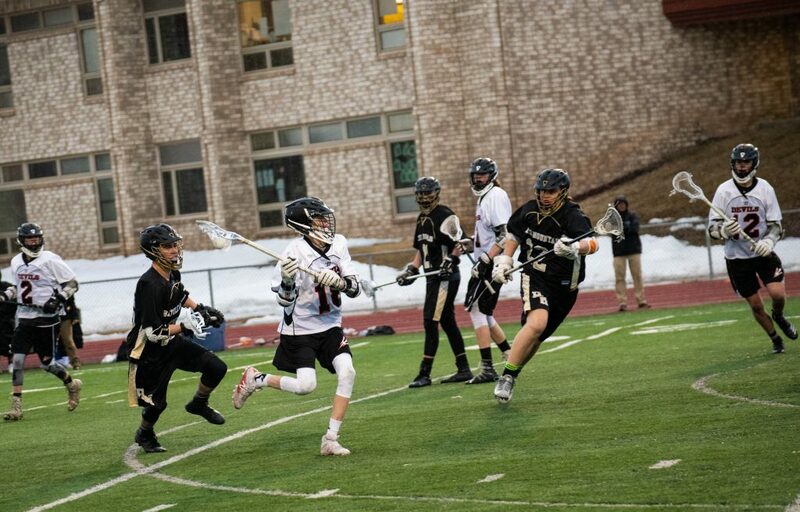 Eagle Valley boys lacrosse defeated Battle Mountain, 12-11, on Thursday night as the Devils recorded their first win over their archrivals since March 7, 2009. “It’s a super cool experience. Oh, man,” Devils goalie Mason Yurcak added. March 7, 2009, was the first game in the history of Eagle Valley’s program. The Devils beat the Huskies at the Eagle County Fairgrounds because both schools were building the turf fields they call home now. With the rivals meeting twice per year with the exception of 2015 and 2016, Battle Mountain had won 17 straight against Eagle Valley. It did not come easily, however. Battle Mountain (2-2 overall an 1-1 in the Western Conference) seemed to have the luck at the buzzer during the first half. The Huskies finished both periods of the first half with goals with 1 second left, one by Caleb Dennis and the second by Tom Boyne, who led Battle Mountain with five scores. Eagle Valley led, 6-4, at the half, but it looked like the Huskies were reestablishing order with four straight goals (Baker Gentry, Tucker Morrow, Nick Walter and Boyne) to start the second half for an 8-6 lead. Petersen answered for the Devils (2-1 overall and in the Western). He scored three straight goals and teammate Keenan Collett added one more for a 10-8 advantage after three. The Devils led by as much as 12-9 with 5:28 left in the game, but the Huskies still had one more charge. Boyne scored with 1:02 left and then with 27 seconds remaining to help Battle Mountain close to 12-11. Eagle Valley won the ensuing faceoff, seemingly icing the game, and its bench called for a timeout. Unfortunately, the Devils had already used their two timeouts, so the ball went back to the Huskies for a final gasp. Yurcak and the Devils’ defense stood tall one last time, and now Eagle Valley can laugh about calling a third timeout. Battle Mountain has experienced the range of emotion this week, and it isn’t over yet. The Huskies recorded a signature win against Aspen on Monday, only to lose to the Devils three days later. That said, Battle Mountain came back and had a chance to tie it up in the final seconds, the coach added. The Huskies don’t have much time to ponder their loss, which is probably a good thing. They head to Littleton today to take on Evergreen. Eagle Valley heads into spring break in a state of good delirium. The Devils host Vail Mountain on April 3.